What is galette des rois? For those unfamiliar with galette des rois, this is a pastry celebrating the Epiphany (6 January). According to (religious) tradition, this symbolises the drawing of the three kings/magi to Epiphany and the visitation of these wise men to Baby Jesus. 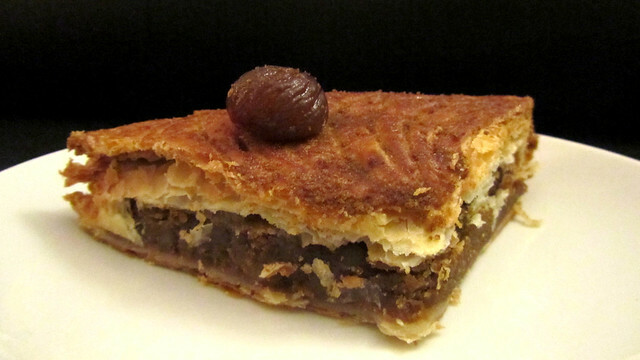 As I mentioned earlier, the galette des rois is made of puff pastry filled with frangipane. Normally, hidden within is a small favour known as fève, traditionally a bean (hence the name) but today in the form of small decorative china (or plastic!) that can be anything from a bean to a flower to a popular cartoon character. Whoever “won” this favour – by getting the slice of galette des rois containing the fève – would be crowned king/queen of the day. Yes, yes, one even gets a paper crown to show off in. There are also companies/organisations which organise an annual, once-off get-together for all staff members (or within individual departments/groups) for a drink and sharing of galettes des rois to kick off the new year on convivial tone. I am 101% behind this initiative! I admit it, since the twelth day of Christmas, I’ve had had my fair share of galette des rois. Nearly daily, come to think of it… But really, I am not that big a glutton (← this woman is in denial) and I have keep the eating in check. I usually buy galette des rois that comes in individual portion size, and not the big ones meant for sharing. Even then, I shared each of them with Frédéric. Downside – no fève to win, no one is king/queen of the day. So far, we’ve tried those from a couple of local boulangeries (not bad but nothing special – we still haven’t yet found a hidden gem that surprises us, darn! ), a couple different ones from Eric Kayser (traditional frangipane, and apple), and a couple from Pierre Hermé (traditional frangipane, and fancy marrons glacés with Muscavado sugar). This is only a mere week in since my first galette des rois for this year, and already we’re off on a good start. There are a few more weeks to come, which means more tasting, and I have a feeling this is going to be epic in proportion. I should probably learn to make my own at home before we bust our food budget for the month because I go buying-happy with a few more fancy galettes des rois. There are certainly no shortage of options in Paris! I’ve seen those but only in supermarkets (e.g. Monoprix – cf first picture above, hidden in the bottom right-ish corner) but admittedly I haven’t been round everywhere to check. I believe those are pretty much southern France thing, so a little less common in Paris. Totally behind Sarah: I do know galette-fatigue and alternating is very helpful! 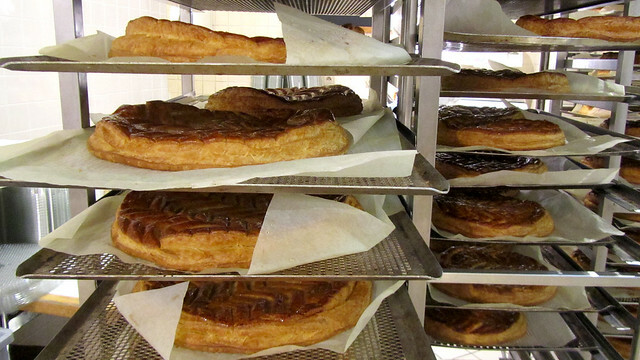 Every year it gets easier and easier to find “royaumes” (brioche-type galettes) in Paris. But it’s still much less frequent than the puff-pastry-type. 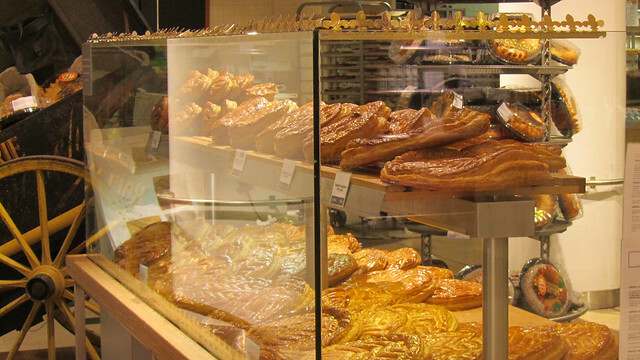 And in Paris if a boulangerie has the brioche-type, they would usually also have the puff-pastry-type (I’ve never seen the other way around, yet?). I’m glad to declare – no galette-fatigue (yet). Maybe it’s because I’ve been reasonable this week. I’ve tried one with walnut earlier this week and now I’ll be testing one with pink grapefruit and clementine! And oh, Pain de Sucre has their own brioche-type but must be pre-ordered.